Very Good. Redemption Revised Edition (Redemption (Karen Kingsbury)) by Karen Kingsbury, 2009-09-01. Trade paperback (US). Glued binding. 371 p. Redemption (Karen Kingsbury), 1. Very Good. 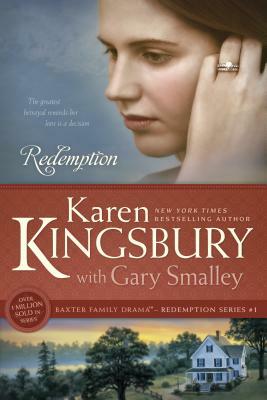 Redemption (Redemption (Karen Kingsbury)) by Smalley, Gary, 2002-11-30. Trade paperback (US). Glued binding. 384 p. Contains: Illustrations. Redemption (Karen Kingsbury), 1. Good. Redemption Revised Edition (Redemption (Karen Kingsbury)) by Karen Kingsbury, 2009-09-01. Trade paperback (US). Glued binding. 371 p. Redemption (Karen Kingsbury), 1. New. Series: Redemption (Karen Kingsbury). Num Pages: 371 pages. BIC Classification: FW; HRCV. Category: (G) General (US: Trade). Dimension: 210 x 141 x 29. Weight in Grams: 306. 2009. Reprinted. Paperback.....We ship daily from our Bookshop. Loved this whole series of books couldn't wait for the next book! Karen Kingsbury - The best ! Just the most wonderful author I've ever read. I enjoyed Redemption very much, but you need to start with the first book in the series and follow thro to the end. I've read every book that Karen has written !! This is a wonderful first book to start a delightful, heart wrenching series. I pass my books on for family to read but will not part completly with them. Karen Kingsbury has done it yet again. In conjunction with Gary Smalley, this book offers adventure in a story of not so pleasant events in the lives of two couples. While adding good advice by using God's morals and Words, this book can give a couple whose lives are corrupted by infidelity a ray of hope and increase one's faith that there is a way to get through the turmoils in a broken marriage. I would recommend it not only for couples that may be going through a divorce but to others that may be contemplating the possibility of divorce. For readers that are happily married, I'd say this book will give you some insight on how you may help someone you know that is going through similiar circumstances. It will also uplift you and also give you some pointers that might well enrich your already stable marriage. I'd recommend this and the whole series. I've only begun to read the series as there are 5 books total. I can't wait to get started on the next one in the series. It'll keep you reading and give your soul inspiration as well as growth in your own faith. Like all of Karen Kingsbury's books, this one was hard to put down. It introduces the Baxter family, focusing on Laura, and allows us to feel what she is feeling as she follows the hard road of love and life. Great read. Couldn't wait to read "Remember", book 2 in the series.